Please Note: this is NOT a 22 Long Rifle rimfire a/k/a (22LR) and NOT a 22 Winchester Magnum (22 WMR) and NOT 22 Winchester Auto. (Save $50.00 over one box cost) SALE! 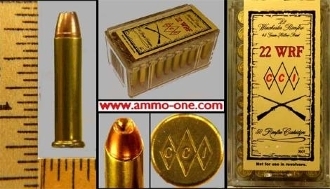 One Box of 50 Cartridges: 22 WRF or .22 Winchester rim fire, special run by C.C.I. now owner by Ammunition Accessories Inc. in Lewiston, Idaho, USA. 3 Diamonds with CCI Diamonds on head stamp, loaded with a 45 grain copper coated H.P. (hollow point) projectile.